In late 1871, Chicot County, Arkansas, was taken over by several hundred African Americans led by state senator and county judge James W. Mason. The murder of an African American lawyer, Wathal G. Wynn, by three white men—John W. Saunders, Jasper Dugan, and Curtis Garrett—angered the black citizens of Chicot County, causing them to take the men from the county jail and kill them. The killings prompted many white residents to flee the county. 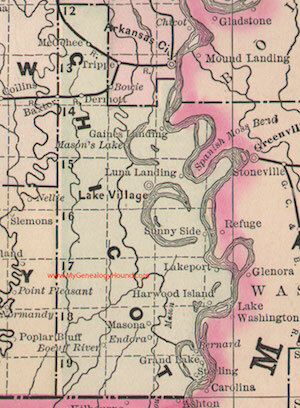 The conflict began in December 1871 when Wathal G. Wynn, who, according to some sources, was James W. Mason’s brother-in-law and was killed in a store in Lake Village, the Chicot County seat. Wynn, one of the first graduates of the newly created Howard University Law School, had been admitted to the Arkansas Bar the previous September. In early December, a public meeting was called to decide whether to use county money to help finance two railroads being built through the northern part of the county. After the meeting, a Lake Village storeowner, John W. Saunders, and two other men, Jasper Dugan and Curtis Garrett, became involved in an argument with Wynn who allegedly called Saunders a liar. In response, Saunders drew his pistol and killed Wynn. The local authorities arrested Saunders, Dugan, and Garrett and put them in the county jail. Mason responded to the murder by sending a letter to Ohio Republican Congressman A.G. Riddle in which he contended that Wynn was actually killed by the three men, all allegedly members of the Ku Klux Klan, for his attempts to organize black voters for the Republican Party. The letter was later published in the Washington Chronicle and reprinted in the New York Times. Meanwhile, approximately three hundred African American men went to the jail; removed Saunders, Dugan, and Garrett; took them into the woods; and shot them dead. As many of the county’s white citizens, fearing a reign of terror, left the area, African Americans were now in control of the town and county. What actually happened next is clouded by differing reports from Democratic and Republican newspapers. The Democratic press reported a reign of terror by local blacks while the Republican papers said that the county was tense, but reports of violence and destruction were exaggerated. James W. Mason, who in 1872 was elected sheriff of the county, was held responsible for the race war and was indicted by the Chicot County Court for instigating the violence. In the summer of 1873, Mason was arrested and charged with murder. He was held in the neighboring Drew County jail until the next meeting of the circuit court. Colonel John A. Williams, an ex-Confederate officer, was appointed special judge in the case by Arkansas’s Republican Governor Ozro A. Hadley. After a trial of several weeks, Mason was released on a writ of habeas corpus. Mason served out his term as sheriff of Chicot County which ended in 1874. Although Democrats regained control of Arkansas politics, African Americans continued to hold most of the offices in Chicot County until 1883. “Chicot County Race War of 1871,” The Encyclopedia of Arkansas History and Culture, http://www.encyclopediaofarkansas.net/encyclopedia/entry-detail.aspx?entryID=7615; Thomas A. Deblack, With Fire and Sword: Arkansas, 1861-1874 (Fayetteville: The University of Arkansas Press.2003). (Fayetteville: The University of Arkansas Press.2003).